As per sthala purana, Kaladushaka - a thief used to donate half of the loot to Perumal kallapiraan. Once, when caught stealing in the Royal palace, he meditated on Lord. Lord entered his body and preached vedanta to the king and then displayed his true form to both the king and the thief. The perumal came to be known as Kallappiran" (Kallan - thief). Once Somakan a demon took away Brahma's knowledge. Brahma after praying (meditating) on the Lord here, regained the srushti gnana which was taken away by the demon. Two Thaayaars in separate sannadhis - Vaigundavalli, Boodevi. Theertham - Brigu Theertham, Taamirabarani river. Access to the temple Has its own railway station(Thirunelveli - Tiruchendoor line). Good bus network too from Tirunelveli. The Moolavar is Sri Vaikundanathan. Other names of him are Kalla Piraan, Paal Pandiyan. Moolavar in Nindra Thirukkolam facing east direction. 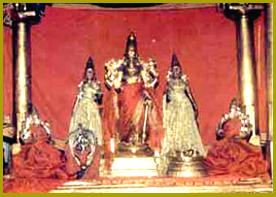 Prathyaksham for Brighu Chakaravarthy and Indiran. Srivaikuntam Divya Desam is situated on the banks of the river Thamparabarani (Copper river) about 35 KM from Tirunelveli town in Tamil Nadu. Srivaikuntam railway station is situated on the Tirunelveli-Tiruchendur line. All passenger trains from Tirunelveli stop at this station The temple is about 1.5 miles from the railway station. Srivaikuntam is also well connected with Tirunelveli, Tiruchendur and Tuticorin by road.